As a family owned company with over a half century of success, we’re big enough to keep you running, but small enough to give you the personalized respect you deserve. We were founded in 1958 by brothers Arlan and Dennis Van Wyk (pronounced ‘Wike’ as in ‘Like’) on the principle of hard work and treating others the way we’d want to be treated. Today, we operate nearly 200 power units and 300 reefers for the time-sensitive transportation of fresh and frozen foods and specialized products in traffic lanes encompassing the upper Midwest to the East coast. 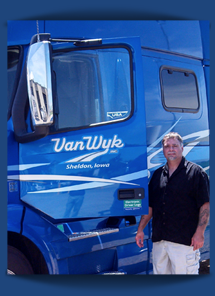 From our headquarters in Sheldon, Iowa, the second generation of Van Wyk family continues to work to provide each of our truck drivers with a great paycheck and an outstanding quality of life.